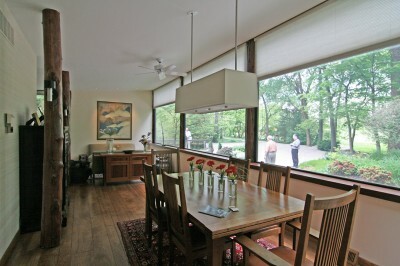 On May 2, 2010, The Sheldon Art Galleries sponsored a benefit tour of four homes designed by St. Louis modernist architect Harris Armstrong. All four homes are within walking distance of each other in the St. Louis County suburb of Sappington, and their ages range from 1937 – 1951. 3 of the 4 homes were actually inhabited by Mr. Armstrong. The home shown above – #2 Sappintong Spur – is the only one of the 4 on the tour that was a commission for a client, the McClure family. This home dates back to 1937 and is about 75% original fabric. 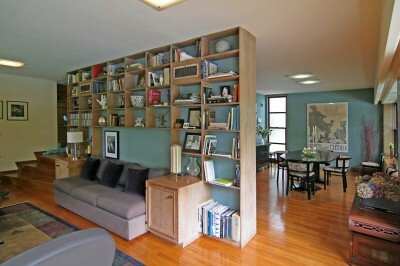 There has been a large and lavish family room and deck added to the rear of the home, which looks great. The rest of the home – including the basement – looks even better. Click for a Flickr photo tour of #2 Sappington Spur. Harris Armstrong obviously fell in love with this private street because he designed this home for his family, right next door! 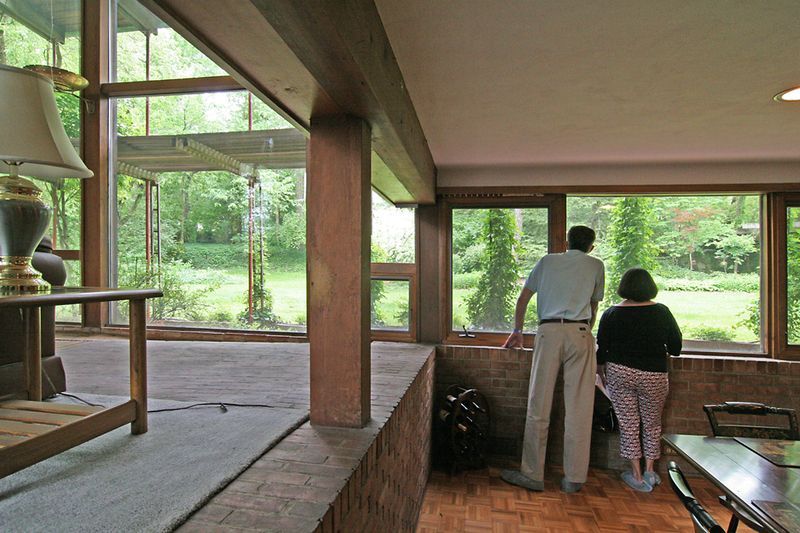 From 1938, this is a split level home, and the exterior combines naturalism with the aesthetic of the burgeoning international modernist movement that was emerging on the West Coast at the time. This home is spectacular, unfolding like a rose! The abundant fenestration, wood built-ins and main level flowing floor plans are clearly modern, while the feel is pure comfort, security and serenity. This place is currently for sale, with an $800k asking price. It is fairly priced, that’s for sure. It’s gorgeous in every way, and fingers crossed till circulation cuts off that it finds a buyer who loves it just as it is. Especially the tribute to Isamu Noguchi on the ceiling of the master bedroom! 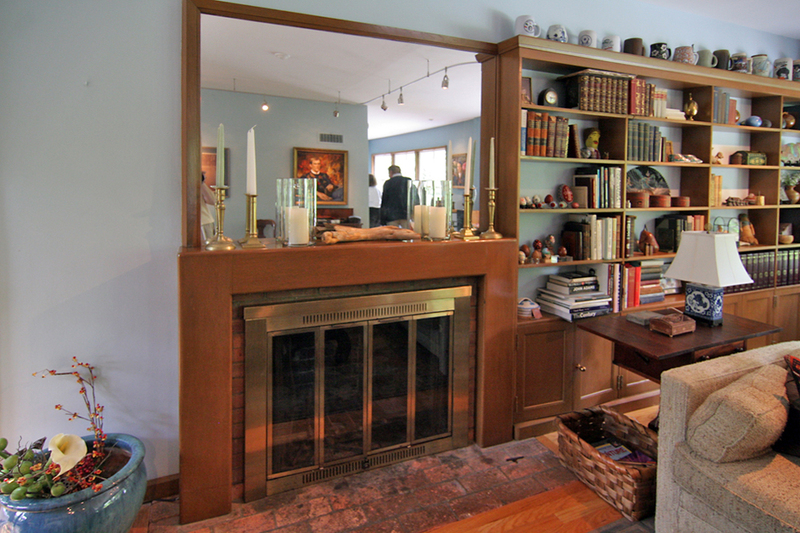 Another great feature while touring this home was finding architect and Armstrong scholar Andrew Raimist at work on his laptop in the den that was once Harris’ home office. He looked so perfectly at home and natural in this setting that I simply took in the scene for several moments before saying hello. Click for a Flickr photo tour of #3 Sappington Spur. 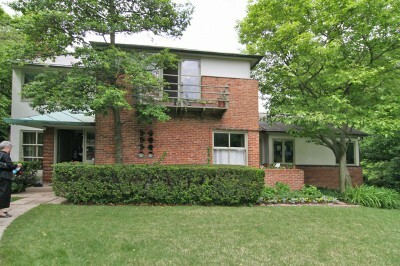 Harris moved a short walk down the hill from #3 Sappington Spur to this 1951 residence. 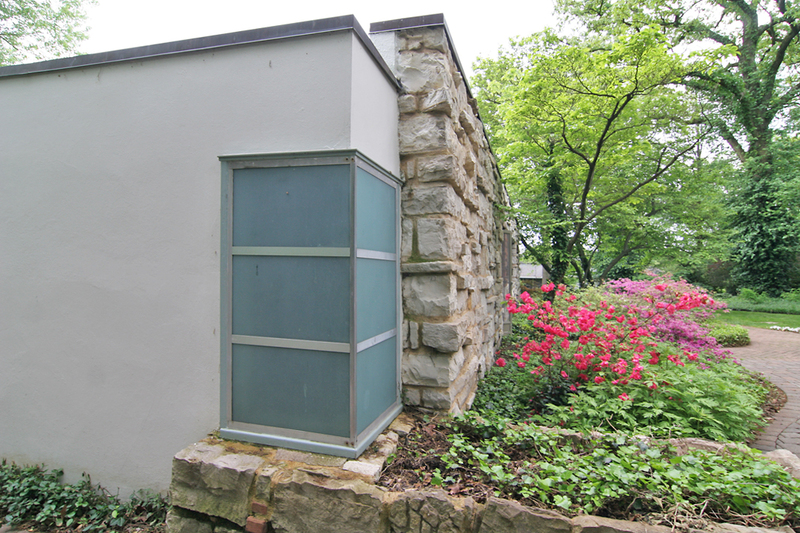 By now, he was the foremost mid-century modern architect in St. Louis with residential and public commissions galore, so he had earned the right to go architecturally hog wild on his new home. The exterior looks like the perfect halfway point between where his work had been and where it was heading, with the rear elevation resembling an elaborate fort made by neighborhood boys, a childhood fantasy writ large. The interior is where things go fantastically bizarre in the best way possible. It’s a series of changing levels and cut outs that is overwhelmingly awesome to look at but begs the question: did any of his kids or guests ever injure themselves? Turns out Harris’ kids were either full-grown and gone or in their late teens when they moved in, so we can assume no children were hurt in the making of this home. As a home one can live comfortably and productively in, #3 Sappington was the clear winner to my mind. But when it comes to jaw-dropping impressiveness, this one wins big! Click for a Flickr photo tour of 200 South Sappington Road. While working on the Magic Chef building, Harris’ home office at #3 Sappington Spur was cramping productivity, so it was time for a stand-alone architectural office, proper. In 1948, he moved into his Asian-inspired design, and talk about impressing clients! Here is the original floor plan of the small office. The dining room shown above was once his drafting studio. 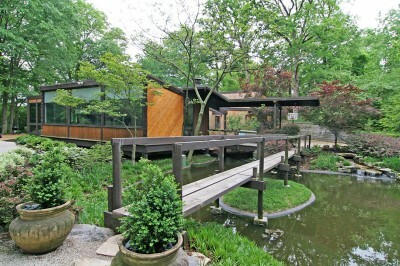 When Armstrong retired in 1969, this office was sold and remodeled into a private home. Several wings were added, essentially quadrupling the size of the structure, and for this tour most all of those areas were closed to the public, but as seen from the outside, they blend and/or coordinate nicely with the original office cube. 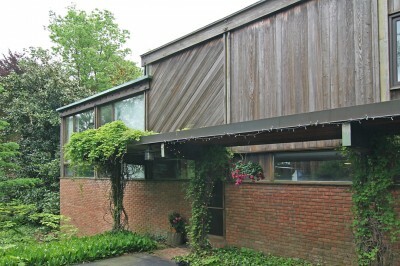 Click for a Flickr photo tour of 934 Singlepath Lane. This entry was posted in mid-century modern residential, modern architecture, st. louis county and tagged andrew raimist, harris armstrong, sappington missouri, the sheldon art galleries by Toby Weiss. Bookmark the permalink.